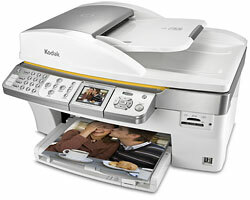 What colour cartridge do I need for the Kodak EasyShare Dock 6000 to print photos? Kind regards, Mrs. M. Divall. How do I replace a Kodak EasyShare 5500 colour cartridge? I've tried to replace one but couldn't. Where can I buy ink cartridges for my Kodak Easyshare 5500 printer (six years old) in Perth? Unfortunately, I am unable to advise of a supplier or a shop where you could purchase cartridges local to yourself. If you do a search on Google for your printer model you should be able to find a local supplier that way. Cartridge Save is a UK only online retailer and we cannot deliver outside of the United Kingdom. The quality of prints from your Kodak 5500 printer is great, but have you checked your ink levels recently? There'll come a time when your Kodak 5500 will gobble up all of your printer ink, and when it happens you'll quickly find that purchasing Kodak 5500 ink can be quite costly. Thank goodness you do not need to waste your time worrying about coughing up the high prices you'll discover on the high street because right here at Cartridge Save you can order all the Kodak 5500 cartridges you'll need at seriously low prices. Spend less money on your ink by purchasing online at Cartridge Save! Don't waste your money buying your 5500 original cartridge or 5500 compatible ink in the main street when you could save a fistful of cash ordering with Cartridge Save. Get total satisfaction when you purchase your EasyShare 5500 ink cartridges from us because they are covered by a rock solid money back guarantee. Don't forget to take into account that each purchase comes with free delivery, generally delivered to your door next day!